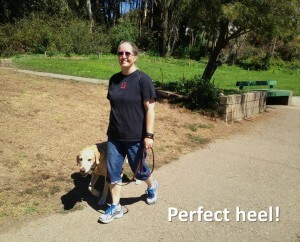 How to walk your dog is as important as the walk itself. When walking your dog, make sure he knows you’re in charge of the walk. That will help him pay attention to you and feel more calm and confident. It builds your relationship as well. Think about why it’s so important… Adult animals migrate every day to get food and water. There is no delivery service for them! 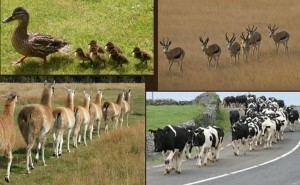 Cows go to pasture, deer forage for food, wolves hunt, and birds fly in formation to their destinations. By walking your dog with purpose every day, you are recreating this primal urge to find food and water as well as giving them an important job. A walk done correctly allows a dog to look to you for leadership and direction and keeps him focused on the task at hand. This is his time to work, just as soccer practice and karate lessons are times for kids to exercise both their minds and bodies. Back yards and dog parks are great, but they aren’t enough. You don’t expect a child to get all of his social and exercise needs met by playing in his backyard. And dog parks are like Chuck e Cheese for kids…. just time for wild running around and acting silly with their friends. It’s fun, but there isn’t discipline, connection with you, and learning being accomplished. Need some help getting your dog to follow you?